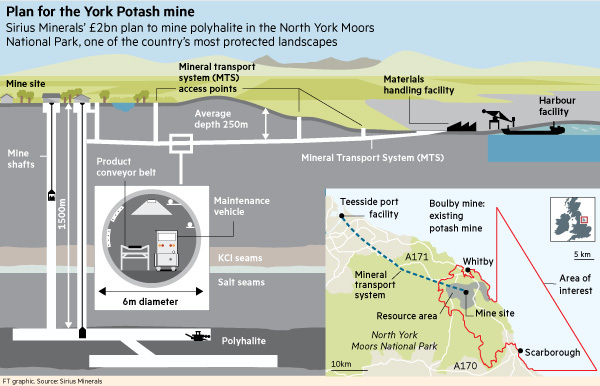 There is little doubt that this week’s decision to develop the worlds largest potash mine within the North York Moors National Park has proved a popular one, at least amongst communities in the North East. Despite opposition from a coalition of campaign groups including the RSPB and Campaign for National Parks, the project has overwhelming support from local MP’s, councils, parishes and the local community in what is an economically depressed area. The mitigation measures to protect the landscape are significant and include a 23 mile underground tunnel to service a portside facility at Teeside, limiting surface impacts after what is bound to be a disruptive five year construction phase. The mine promises to create thousands of local jobs and also bring millions in tax revenues. It could even help solve some of the challenges facing global food production. Sound too good to be true? Time will tell as to the real speed and size of economic investment this project brings to local economies. The Australian founded mining company Sirius Minerals is still to find investors for the majority of the £2bn costs while as of yet a market for its end product, polyhalite, remains unproven. Regardless of the economic outcome, serious questions are now on the horizon for other UK National Park Authorities facing further extractive industry proposals. For a start, what will constitute ‘exceptional circumstances’ needed for planning approval of large scale developments in other UK National Parks? In this case, the promise of 1000 jobs, £1bn added to the UK economy and strong environmental mitigation measures have, in the opinion of the National Park Authority, provided the exceptional circumstances needed to override the statutory protections afforded to National Parks under UK law. It is very possible the coalition of opposition groups to the mine will seek judicial review or appeal, one of their strongest objections being that the project could have been sited outside the National Park boundaries. If the Authorities decision is challenged Sirius will need to further substantiate its Alternative Site Assessment to show mitigation measures were as much as is ‘reasonably practicable’, bringing more fuzzy legal concepts as yet to be tested in the UK Courts. Other extractive industries will be watching closely and now have a bench mark from which to assess planning consent within UK National Parks. Third Energy, with their plans for gas drilling in the north of the North York Moors Park more than anybody. Bearing this in mind, at what point do extractive industry projects within national parks cease to be exceptional? Obviously on a case by case basis. From a global perspective, however, hundreds of protected areas are threatened and impacted by extractive industries worldwide, a situation monitored by the WWF under its PADDD initiative. In fact, for environmental campaigners extractive industry megaprojects inside protected areas are increasing at an alarming rate. What ever the outcome of legal battles that lie ahead for UK National Park Authorities it is surely now time to end the misnomer of the UK National Park network and do more to standardize our National Parks with international norms. Doing so would strengthen their protection in the face of increasing pressure on natural resources and clarify what is presently a confusing situation. The IUCN, the governing body of global protected area does not recognise UK National Parks as such, categorising UK National Parks as category V Protected Landscapes. IUCN category II National Park designation is reserved for areas with far stronger conservation criteria and legal protections. The mine’s approval now casts into doubt even on this category V Protected Landscape categorisation – IUCN policy on Protected Landscapes does not include an ‘exceptional circumstances’ clause to circumvent legal protection. This is not simply a case of semantics. Calling UK protected areas National Parks while not affording them the protections of category V Protected Landscapes fudges international definitions, further worsening an already confusing situation. Ultimately it weakens the case for protecting ‘real’ category II National Parks globally. As in, you mine your National Parks so why can’t we mine ours. The 64 hectare mining site needs to be degazetted from the Park and boundaries redrawn to include an adequate buffer zone from mine lights, dust and noise. After all, no one is pretending a mega mine construction site and its immediate surroundings are of great national conservation and amenity value. Further more it is time to be clearer as to what UK National Parks really are, protected landscapes whose conservation and amenity value does not necessarily afford it protections over unsustainable extractive industry projects. Not doing so endangers real category II National Parks and conservation efforts globally.